Posted on February 16, 2016 by Hillary T.
Maple sugaring—collecting and boiling maple sap to make syrup and other sugary products—is a beloved late-winter activity in Massachusetts. Dip into the history and science of this sweet treat by reading the latest issue of Connections, Mass Audubon’s member newsletter, and checking out Much Ado About Maple blog post. Blue Hills Trailside Museum in Milton offers Maple Sugar Days at Brookwood Farm in Canton on March 19 and 20. Learn how maple sugar was made through the ages and sample some delicious syrup. Drumlin Farm in Lincoln gives visitors the opportunity to get an up-close view of a working maple syrup evaporator. The wildlife sanctuary offers related family programs such as Sip Some Sap on March 10. Plus, tuck into a hearty meal at the Sap-to-Syrup Farmer’s Breakfast on March 12 and 13. Ipswich River in Topsfield presents sugaring-off tours in February and March and other programs that show how the sweet stuff makes it from tree to table. Don’t miss the annual Spring Flapjack Fling on March 19—eat a pancake breakfast, go on a sugaring tour, or do both! Moose Hill in Sharon throws a Maple Sugaring Festival on March 13, 19, and 20. Take part in fun activities and go on a guided walk to discover the history and process of turning sap into syrup. North River in Marshfield has a Maple Sugaring Celebration on March 19. 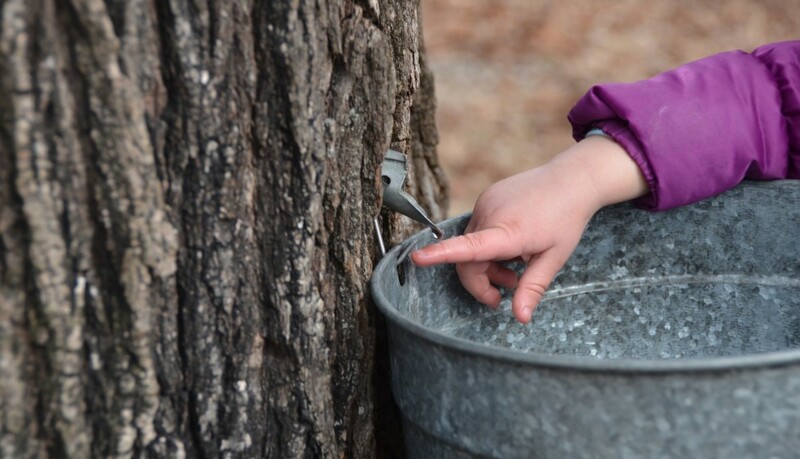 Participate in outdoor stations that explore maple trees and tree tapping throughout history, tap a tree, and sample different grades of syrup and maple sugar with silver dollar pancakes. Ready to make your own maple products? The Audubon Shop sells taps, how-to guides, and books with maple sugar history, science, and recipes. This entry was posted in Get Outdoors on February 16, 2016 by Hillary T..